Give your decor a homey update with this lovely sham. Featuring honeycomb quilting and finished with self-fabric piping, the sham is available in a soothing ivory, taupe, or light green color to match your decor. I purchased the entire set of this bedroom ensemble for our guest room. The shams are very long and not skimpy like some shams can be and they have the wonderful "Frog" closures on the ends with a fold to hide the pillow. Of note, each piece is slightly off in color, which I assume is due to dye lots. At first, this bothered me, but after having it for a while, I don't even notice it and I am very happy that I purchased the set. I like these pillow shams very much...nicely made and different. I just wish I had chosen the pale green as the ivory, in my room, is plain looking. Love my bedspread with these shams. Beautiful tailored look that is tasteful and somewhat contemporary. 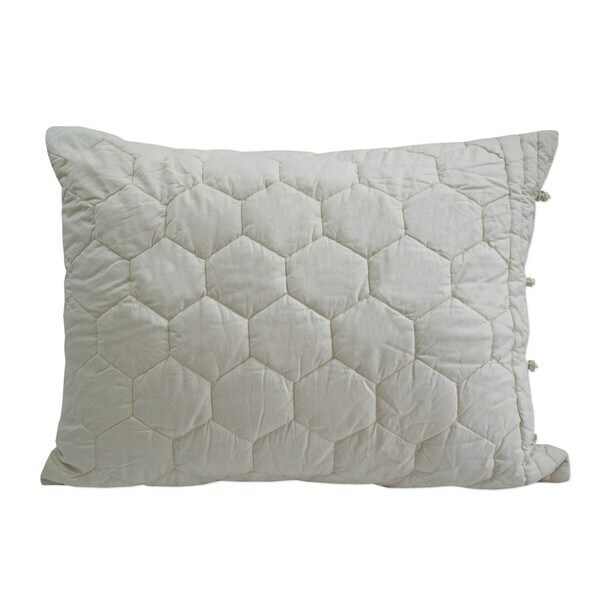 Also bought the matching hexagon decorative pillow, too, to add interest. This sham is well made. I truly like the closure for this sham. This Sham is a perfect match to the green bedspread. easy to put the pillow in and its a neat fit. I purchased the bedspread first and then I ordered to Shams. The colors are off and the shams do not match the bedspread exactly. This sham is nice and comfortable. The quality is great and it shows well. These shams match the bedspread very nicely. The design is elegant & practical. The cost for this beauty was so reasonable. I would highly recommend this to others. Looks beautiful with the matching bedspread and matching hexagon shaped pillow (sold separately). Very well made, love the pretty little knotted closings on each side. So unique! Makes me happy every time I look at them. This is a very nice product. It matches the bedspread perfectly. Fits nice and snug on pillows. Gorgeous, vintage style shams that I purchased with the bedspread. "Is this a set of 2 shams, or is the cost reflective of just 1 piece?" This listing is for a single sham. Previously ordered 2; decided needed 2 more! Matched the bedspread I ordered.